for Hurstville South Public School! Purchase an Entertainment™ Book from us today and 20% of your Book purchase goes towards our fund-raising – plus, FREE DELIVERY! 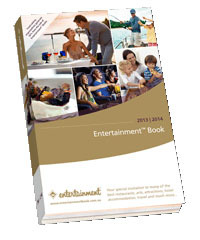 The NEW Entertainment™ Books are now available! Buy a Book now to discover the many valuable offers in the NEW Sydney Entertainment™ Books! Books are packed with hundreds of up to 50% off and 2-for-1 offers for the best restaurants, cafés, attractions, hotel accommodation, travel and much more! Selling for only $65, you'll receive $15,000 worth of valuable offers that you can use right away, up until 1 June 2014! Plus, the good news is that $13 from your Book purchase goes towards our fund-raising. The more Books we sell the more we raise so please forward this email to your family and friends! 20% of your Book purchase goes towards our fundraising!